3-D Monster: I Gots Me a Bona-Fide Blog Award! 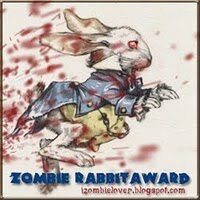 My ghoul buddy Erik over at The Wonderful Wonderblog (and it is, by the way) has bestowed upon me the much-coveted Zombie Rabbit Award for blogging excellence! I'm assuming it comes with a check or a trophy or something. I don't know what to say... it's all so sudden! I'd like to thank my family, all of my loyal readers, my third-grade teacher Mrs. Peters who encouraged my writing..sniff, sniff...(I promised myself I wouldn't cry). And thank you Erik - who believed in a little-known blog and saw potential! I LOVE YOU MAN!!!! Now I have to pass this award on to ten other worthy blogs. This is not a vocation to be taken lightly - I will have to take my time... and choose wisely. 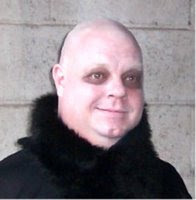 This guy just joined us at my Blog ("the Crypt") ... Cool! !